As a Chartered Accountant (M), Suhaila has 21 years of experience in various industries inclusive of Audit & Consultancy, Oil & Gas, Hospitality, Event Management & Training and Property Management. In her current role as the Group Chief Executive Officer (CEO) of KEJORA Development Holding Sdn. Bhd. (KDHSB), a company wholly owned by Lembaga Kemajuan Johor Tenggara (KEJORA), in Bandar Penawar, Desaru, Johor, Suhaila is responsible for the overall operations of KDHSB and its subsidiaries, namely KEJORA Agro Sdn. Bhd. which is focusing on agricultural business activities, KEJORA Hospitality & Services Sdn. Bhd. which is focusing on hospitality business activities and KEJORA Land Development Sdn. Bhd., a property development arm for KEJORA in this region. Suhaila is a person who believes in the power of knowledge and education. She has a Bachelor’s Degree in Accounting from the International Islamic University Malaysia (IIUM) and Advanced Diploma in Logistics Management from the Chartered Institute of Logistics and Transport United Kingdom. She is also recognised as a Competent HRDF Trainer by the Human Resource Development Fund (HRDF) Malaysia. What are the current developments undertaken by KEJORA Development Holding Group? Currently, we are focusing on human capital development, property development and are also filling in the gap in food supply chain by working closely with FAMA in producing premium and niche agricultural products from our greenhouses and farms. What are your plans for KEJORA Development Group for 2019? In 2019, KEJORA Land Development Sdn. Bhd. (KLDSB) will continue to develop Phase 2 of Taman Permata Penawar, which is on schedule, and at the same time, build more Rumah Mampu Biaya as aspired by the Johor Menteri Besar. That is our responsibility as a government agency. For KEJORA Agro Sdn. Bhd. (KASB), we will maximise our land to produce agricultural products to meet locals’ needs. As for KEJORA Hospitality & Services Sdn. Bhd. (KHSSB), we will add more value to our services for guests’ satisfaction. KEJORA Development Holding Group is the holding company of KLDSB, KASB and KHSSB. 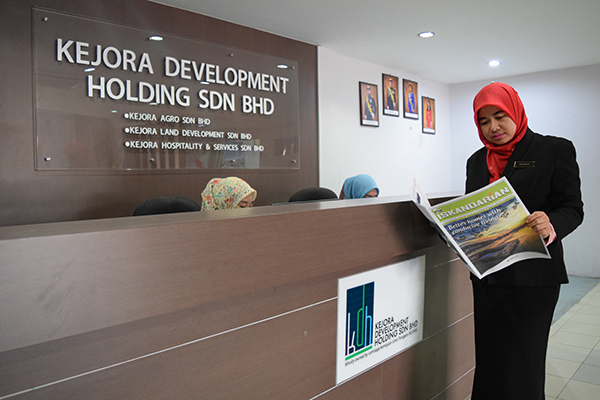 Each subsidiary is focusing on a specific target area in the market to maximise KEJORA’s contribution to the society in Johor Tenggara Region by providing good quality living environment through KEJORA Land Sdn. Bhd., supplying fresh agricultural products through KEJORA Agro Sdn. Bhd. and providing an exclusive haven, away from the city at Bayu Balau Beach Resort which is managed by KEJORA Hospitality Sdn. Bhd. This is more practical and strategic approach by all subsidiaries to act as commercial arms for KEJORA. Since our establishment six years ago, KLDSB have successfully developed housing projects for rural areas, such as Taman Permata Layang, Kampung Tersusun Tuan Seh and Phase 1 of Taman Permata Penawar at Bandar Penawar, Desaru, Johor. Phase 2 is ongoing. We are doing our best to add more success stories in our profile and so far we are doing great by delivering projects timely. Your views on the property market as a whole? Not all sectors in the property market are going down because it depends on location and the confidence level of end financiers. In Johor Tenggara Region, of which half of the population earn income from agricultural activities, demand for residential properties is high but the challenge is to convince financial institutions to become the end financier because most of the farmers do not have pay slips or audited financial statements. They are not business owners. As a developer, KLDSB has a social obligation to provide a comfortable and affordable home for the communities in Johor Tenggara Region but our effort will not reach the target group if no one is able to get financial assistance to buy a house. Therefore, we took a step ahead and became a solution enabler by negotiating with financial institutions to ensure that everyone has an equal opportunity to own a house. Currently, we have approached a few banks in Kota Tinggi and some of the banks are considering this matter. It’s a win-win solution for everyone. We acknowledge the risk associated to this but we believe that all of us; developers, financial institutions and regulators, can work together and put on our thinking hats to get the best solution for the benefit of the society. On the other hand, industrial property segment is still seeing good growth in terms of transaction and value especially in Pengerang, which is much driven by the PIPC project. This is next in our business development plan. With so many portfolios under you, how do you manage to stay on top of things? I have been trained to be on top of things since my early days in Petronas. I am blessed to have a strong support system from KEJORA especially from our General Manager, two Vice General Managers, board of directors and all staffs from the group companies. It’s all about time management, assessing situations, prioritising tasks, leveraging with trust, providing clear requirements, proper guidance, following up closely, empowering staffs and most importantly, having a strong teamwork. I have been involved in training since 2009, mainly in leadership, motivational, self-development and business development programmes. I just love to share knowledge and experience with the public, especially the youth; our future leaders. I’m happy to see them succeed in their life. It’s about making a difference in the society in a positive manner. The training industry is similar to other industries in terms of delivering products (i.e. training programmes) according to market needs. As we are in the knowledge economy, demand for trainings and seminars have increased. Knowledge has no boundaries. Sometimes we have to import international speakers and trainers to tap on their expertise and advanced technologies especially on specialised industry such as oil & gas, aerospace, nuclear physics and robotics. In accounting field, we need more trainers on oil & gas accounting and property development accounting. I am able to comment specifically on those industries because I am (was) involved in it. It is not easy to hire a well-trained general ledger accountant in those industries. And perhaps, in the near future we need to train more accountants in dealing with crypto currency because there are companies and individuals who use it as their business currency. In short, we have to keep ourselves abreast with the ever changing economic activities in order to succeed. Learning process will never end. Whenever I got time for myself, I rest, reflect and rejuvenate by connecting myself with Allah, reading books, watching selective TV programmes, gardening and spending quality time with my loved ones. I will always embrace each and every moment of my life gracefully.